Five years ago, I visited the newly-established Sandy Park Stadium in Exeter for the first time. Although beaten by Leinster in that particular European Pool game, everything about the Exeter operation then smacked of efficiency and professionalism. Here was a club in a rugby hotbed that was going forward at a rate of knots. It was a rugby evolution parallel with Scotstoun and the emergence of the Warriors in Glasgow at the other end of the UK mainland. Nothing that has happened in the interim has changed that initial take. On the contrary, both the Warriors and Chiefs are at the cutting edge of top-class professional rugby domestically and in Europe. Whatever the polar opposite to Brexit is in rugby terms then Rob Baxter and Exeter is it. They are now the equivalent of a force of nature. What Shannon was to AIL rugby in its heyday and Munster to the Heineken Champions Cup when at their best, Exeter Rugby are to the English game. What has evolved is a mean machine, a juggernaut that when in possession is mighty hard to dispossess and getting more difficult by the year with Baxter at the helm. The Sandy Park director of rugby reminds me of Declan Kidney and how he approached the quest for that first Champions Cup star and Munster's eventual climb to Europe's summit. In the context of today's opening game in Pool 2, that fact scares me. Munster are accustomed to crossing the Irish Sea and taking on top English Premiership opposition in the opening match, often setting up the return tilt in Thomond come January as the Pool decider with qualification for the knockouts the ultimate aim. Same now as ever it was with the unstated target of at least a losing bonus point the type of ambition that's appropriate today. Of course they will reach for the sky and that precious away win but, realistically, Exeter appears a hurdle much too high to overcome at this point in time. But Johann van Graan's side showed a lot of grit in defeat to Leinster in their best performance thus far this season by a mile. They have issues in some key areas, not least at scrum half and midfield, but in terms of the collective it is that time of year for Munster to turn back the clock. If they are to come remotely close to point-taking territory then it is essential that three key pieces have been put in place in the last week. First and foremost, they must tap into the European factor, the history and tradition that makes Munster Rugby the force that it is and the one to be feared irrespective of any other element. They may have but two outright title successes to date, trailing behind Leinster, Toulouse and Toulon (with three bought-in titles) but mention the Heineken, the Champions Cup or Heineken Champions Cup as it is now and Munster is the name that comes most immediately to mind over the length and breadth of Europe. They are the yardstick and, whisper it, almost everybody's second favourite team. You cannot put a value on that belligerence and fighting spirit. It is in the Munster DNA but does not erupt as a matter of course. Therein lies the psychological pressure on Peter O'Mahony in ensuring that every single one of the 23 hits fever pitch today. Secondly, and most blindingly obvious, is the imperative in attacking (almost a misnomer) Exeter where they are strongest and that clearly is up front. But the critical element is tempo with at least the equal in physicality a must - but the tempo of that physicality must be controlled. It represents the key collective for me and a huge test for Joey Carbery in picking up that playmaking gauntlet. There is huge pressure on both halves. For Carbery, this is what that much-hyped transfer was all about and for Duncan Williams it's a chance to prove the doubters wrong. I may be included among those on the basis of the tempo-destroying, snail-paced game that this otherwise talented scrum half tends to impose, specifically in or around the ruck. Munster need that high-intensity, all-embracing, forward-oriented game more than any other team in this great competition. To deflate their own balloon through a self-defeating kicking approach would be rugby suicide. A big test too for Castletroy's finest in Neil Cronin, if and when that moment arrives. On the assumption that Munster go back to hit the present in bringing all those obvious elements to today's fight, there is still a growing menace to this Exeter squad. The addition of Santiago Cordero and Alex Cuthbert (although not on board today) brings little need for elaboration as to the wider danger. Relatively old hands they may be but Jack Nowell on the wing, Henry Slade in the centre and Ulster's finest in Gareth Steenson fully get what this opening joust is all about. Steenson and fellow Ulsterman Ian Whitten combine at ten and 12 for what is guaranteed to be a hard border for the visitors. From a Munster perspective, former Sale recruit Mike Haley might just bring a new and creative dynamic in attacking terms. 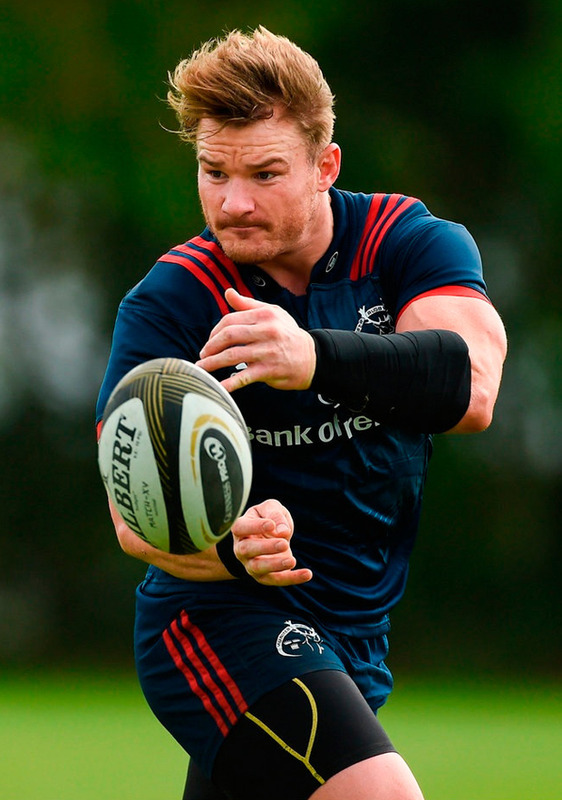 However, the key individual component in today's conservatively-restructured jigsaw - as it was against Leinster seven days ago - is Chris Cloete. The fact that Tommy O'Donnell can't make the starting back-row is testimony to what the fit-again Cloete brings to the dogfight. He is the definitive scavenging mongrel but with a near immovable low centre of gravity to boot. Cut Cloete loose and not just anything but everything is possible.